In mgmt we have meta parameters. They are similar in concept to what you might be familiar with from other tools, except that they are more clearly defined (in a single struct) and vastly more powerful. Noop stands for no-operation. If it is set to true, we tell the CheckApply portion of the resource to not make any changes. It is up to the individual resource implementation to respect this facility, which is the case for all correctly written resources. You can learn more about this by reading the CheckApply section in the resource guide. If you’d like to set the noop state on all resources at runtime, there is a cli flag which you can use to do so. 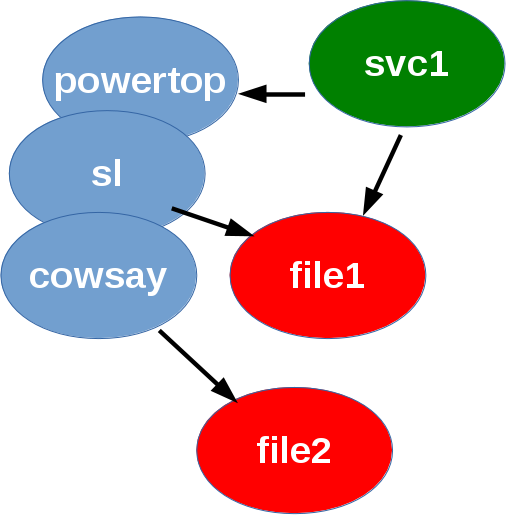 It is unsurprisingly named --noop, and overrides all the resources in the graph. This is in stark contrast with Puppet which will allow an individual resource definition to override the user’s choice! james@computer:/tmp$ time puppet apply --noop noop.pp    # safe right? If you look closely, Puppet just trolled you by performing an operation when you thought it would be noop! I think the behaviour is incorrect, but if this isn’t supposed to be a bug, then I’d sure like to know why! It’s worth mentioning that there is also a noop resource in mgmt which is similarly named because it does absolutely nothing. In mgmt we can run continuously, which means that it’s often more useful to do something interesting when there is a resource failure, rather than simply shutting down completely. As a result, if there is an error during the CheckApply phase of the resource execution, the operation can be retried (retry) a number of times, and there can be a delay between each retry. The delay value is an integer representing the number of milliseconds to wait between retries, and it defaults to zero. The retry value is an integer representing the maximum number of allowed retries, and it defaults to zero. A negative value will permit an infinite number of retries. If the number of retries is exhausted, then the temporary resource failure will be converted into a permanent failure. Resources which depend on a failed resource will be blocked until there is a successful execution. When there is a successful CheckApply, the resource retry counter is reset. In general it is best to leave these values at their defaults unless you are expecting spurious failures, this way if you do get a failure, it won’t be masked by the retry mechanism. It’s worth mentioning that the Watch loop can fail as well, and that the retry and delay meta parameters apply to this as well! While these could have had their own set of meta parameters, I felt it would have unnecessarily cluttered up the interface, and I couldn’t think of a reason where it would be helpful to have different values. They do have their own separate retry counter and delay timer of course! If someone has a valid use case, then I’m happy to separate these. If someone would like to implement a pluggable back-off algorithm (eg: exponential back-off) to be used here instead of a simple delay, then I think it would be a welcome addition! Despite mgmt being event based, there are situations where you’d really like to poll instead of using the Watch method. For these cases, I reluctantly implemented a poll meta parameter. It does exactly what you’d expect, generating events every poll seconds. It defaults to zero which means that it is disabled, and Watch is used instead. Despite my earlier knock of it, it is actually quite useful, in that some operations might require or prefer polling, and having it as a meta parameter means that those resources won’t need to duplicate the polling code. This might be very powerful for an aws resource that can set up hosted Amazon ec2 resources. When combined with the retry and delay meta parameters, it will even survive outages! One particularly interesting aspect is that ever since the converged graph detection was improved, we can still converge a graph and shutdown with the converged-timeout functionality while using polling! This is described in more detail in the documentation. In mgmt, the events generated by the Watch main loop of a resource do not need to be 1-1 matched with the CheckApply remediation step. This is very powerful because it allows mgmt to collate multiple events into a single CheckApply step which is helpful for when the duration of the CheckApply step is longer than the interval between Watch events that are being generated often. In addition, you might not want to constantly Check or Apply (converge) the state of your resource as often as it goes out of state. For this situation, that step can be rate limited with the limit and burst meta parameters. The limit and burst meta parameters implement something known as a token bucket. This models a bucket which is filled with tokens and which is drained slowly. It has a particular rate limit (which sets a maximum rate) and a burst count which sets a maximum bolus which can be absorbed. This doesn’t cause us to permanently miss events (and stay un-converged) because when the bucket overfills, instead of dropping events, we actually cache the last one for playback once the bucket falls within the execution rate threshold. Remember, we expect to be converged in the steady state, not at every infinitesimal delta t in between. The limit and burst metaparams default to allowing an infinite rate, with zero burst. As it turns out, if you have a non-infinite rate, the burst must be non-zero or you will cause a Validate error. Similarly, a non-zero burst, with an infinite rate is effectively the same as the default. A good rule of thumb is to remember to either set both values or neither. This is all because of the mathematical implications of token buckets which I won’t explain in this article. Sema is short for semaphore. In mgmt we have implemented P/V style counting semaphores. This is a mechanism for reducing parallelism in situations where there are not explicit dependencies between resources. This might be useful for when the number of operations might outnumber the number of CPUs on your machine and you want to avoid starving your other processes. 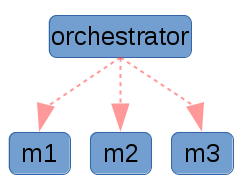 Alternatively, there might be a particular operation that you want to add a mutex (mutual exclusion) around, which can be represented with a semaphore of size (1) one. Lastly, it was a particularly fun meta parameter to write, and I had been itching to do so for some time. To use this meta parameter, simply give a list of semaphore ids to the resource you want to lock. These can be any string, and are shared globally throughout the graph. By default, they have a size of one. To specify a semaphore with a different size, append a colon (:) followed by an integer at the end of the semaphore id. Valid ids might include: “some_id:42“, “hello:13“, and “lockname“. Remember, the size parameter is the number of simultaneous resources which can run their CheckApply methods at the same time. It does not prevent multiple Watch methods from returning events simultaneously. If you would like to force a semaphore globally on all resources, you can pass in the --sema argument with a size integer. This will get appended to the existing semaphores. For example, to simulate Puppet’s traditional non-parallel execution, you could specify --sema 1. Oh, no! Does this mean I can deadlock my graphs? Interestingly enough, this is actually completely safe! The reason is that because all the semaphores exist in the mgmt directed acyclic graph, and because that DAG represents dependencies that are always respected, there will always be a way to make progress, which eventually unblocks any waiting resources! The trick to doing this is ensuring that each resource always acquires the list of semaphores in alphabetical order. 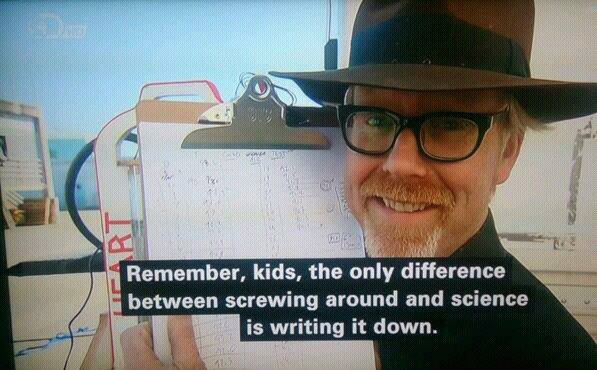 (Actually the order doesn’t matter as long as it’s consistent across the graph, and alphabetical is as good as any!) Unfortunately, I don’t have a formal proof of this, but I was able to convince myself on the back of an envelope that it is true! Please contact me if you can prove me right or wrong! The one exception is that a counting semaphore of size zero would never let anyone acquire it, so by definition it would permanently block, and as a result is not currently permitted. The last important point to mention is about the interplay between automatic grouping and semaphores. When more than one resource is grouped, they are considered to be part of the same resource. 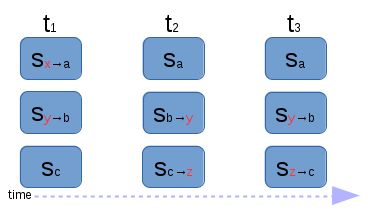 As a result, the resulting list of semaphores is the sum of the individual semaphores, de-duplicated. This ensures that individual locking guarantees aren’t broken when multiple resources are combined. If you have ideas for future meta parameters, please let me know! We’d love to hear about your ideas on our mailing list or on IRC. If you’re shy, you can contact me privately as well. This is a bit of an apples vs. flame-throwers comparison because I’m comparing the mgmt engine meta parameters with the puppet language meta parameters, but I think it’s worth mentioning because there’s a clear separation between the two in mgmt, where as the separation is much more blurry in the puppet scenario. It’s also true that the mgmt language might grow a concept of language-level meta parameters which has a partial set that only maps partially to engine meta parameters, but this is a discussion for another day! It’s no secret to the readers of this blog that I’ve been active in the configuration management space for some time. I owe most of my knowledge to what I’ve learned while working with Puppet and from other hackers working in and around various other communities. I’ve published, a number, of articles, in an, attempt, to push, the field, forwards, and to, share the, knowledge, that I’ve, learned, with others. I’ve spent many nights thinking about these problems, but it is not without some chagrin that I realized that the current state-of-the-art in configuration management cannot easily (or elegantly) solve all the problems for which I wish to write solutions. To that end, I’d like to formally present my idea (and code) for a next generation configuration management prototype. I’m calling my tool mgmt. The code is available, but you may prefer to read on as I dive deeper into each of these elements first. Fundamentally, all configuration management systems represent the dependency relationships between their resources in a graph, typically one that is directed and acyclic. 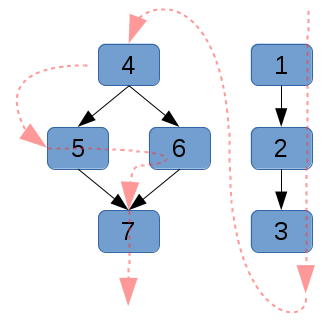 Directed acyclic graph g1, showing the dependency relationships with black arrows, and the linearized dependency sort order (a topological sort) with red arrows. Unfortunately, the execution of this graph typically has a single worker that runs through a linearized, topologically sorted version of it. 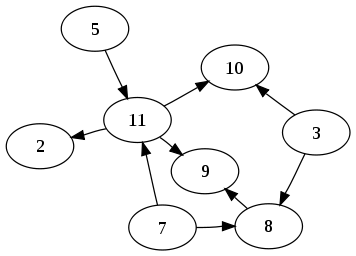 There is no reason that a graph with a number of disconnected parts cannot run each separate section in parallel with each other. 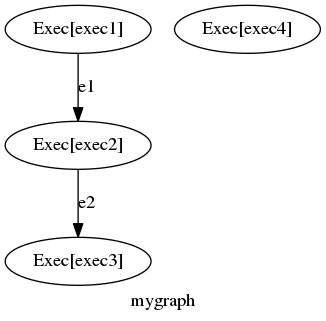 Graph g2 with the red arrows again showing the execution order of the graph. Please note that this graph is composed of two disconnected parts: one diamond on the left and one triplet on the right, both of which can run in parallel. 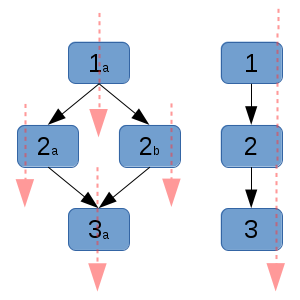 Additionally, nodes 2a and 2b can run in parallel only after 1a has run, and node 3a requires the entire left diamond to have succeeded before it can execute. 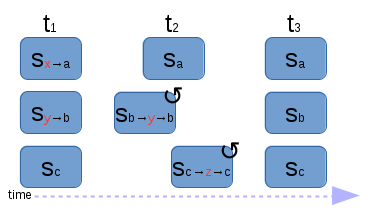 Typically, some nodes will have a common dependency, which once met will allow its children to all execute simultaneously. This is the first major design improvement that the mgmt tool implements. 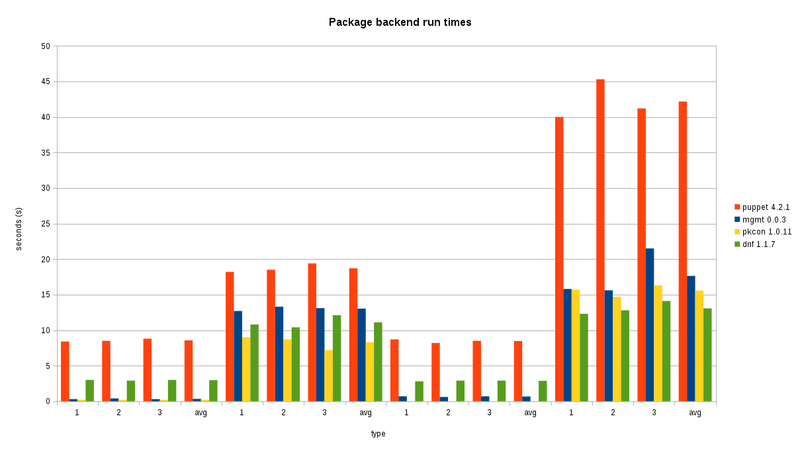 It has obvious improvements for performance, in that a long running process in one part of the graph (eg: a package installation) will cause no delay on a separate disconnected part of the graph which is in the process of converging unrelated code. It also has other benefits which we will discuss below. In practice this is particularly powerful since most servers under configuration management typically combine different modules, many of which have no inter-dependencies. 22:55:04 Graphviz: Successfully generated graph! This example is obviously contrived, but is designed to illustrate the capability of the mgmt tool. Hopefully you’ll be able to come up with more practical examples. All configuration management systems have some notion of idempotence. Put simply, an idempotent operation is one which can be applied multiple times without causing the result to diverge from the desired state. In practice, each individual resource will typically check the state of the element, and if different than what was requested, it will then apply the necessary transformation so that the element is brought to the desired state. The current generation of configuration management tools, typically checks the state of each element once every 30 minutes. Some do it more or less often, and some do it only when manually requested. In all cases, this can be an expensive operation due to the size of the graph, and the cost of each check operation. This problem is compounded by the fact that the graph doesn’t run in parallel. In this time / state sequence diagram g3, time progresses from left to right. Each of the three elements (from top to bottom) want to converge on states a, b and c respectively. Initially the first two are in states x and y, where as the third is already converged. At t1 the system runs and converges the graph, which entails a state change of the first and second elements. At some time t2, the elements are changed by some external force, and the system is no longer converged. We won’t notice till later! At this time t3 when we run for the second time, we notice that the second and third elements are no longer converged and we apply the necessary operations to fix this. An unknown amount of time passed where our cluster was in a diverged or unhealthy state. Traditionally this is on the order of 30 minutes. More importantly, if something diverges from the requested state you might wait 30 minutes before it is noticed and repaired by the system! The mgmt system is unique, because I realized that an event based system could fulfill the same desired behaviour, and in fact it offers a more general and powerful solution. This is the second major design improvement that the mgmt tool implements. These events that we’re talking about are inotify events for file changes, systemd events (from dbus) for service changes, packagekit events (from dbus again) for package change events, and events from exec calls, timers, network operations and more! In the inotify example, on first run of the mgmt system, an inotify watch is taken on the file we want to manage, the state is checked and it is converged if need be. We don’t ever need to check the state again unless inotify tells us that something happened! In this time / state sequence diagram g4, time progresses from left to right. After the initial run, since all the elements are being continuously monitored, the instant something changes, mgmt reacts and fixes it almost instantly. If we don’t want the mgmt program to continuously monitor events, it can be told to exit after the graph converges, and run again 30 minutes later. This can be done with my system by running it from cron with the --converged-timeout=1, flag. This effectively offers the same behaviour that current generation systems do for the administrators who do not want to experiment with a newer model. Thus, the current systems are a special, simplified model of mgmt! It is possible that some resources don’t offer an event watching mechanism. In those instances, a fallback to polling is possible for that specific resource. Although there currently aren’t any missing event APIs that your narrator knows about at this time. A monitoring system (read: nagios and friends) could probably be built with this architecture, thus demonstrating that my world view of configuration management is actually a generalized version of system monitoring! They’re the same discipline! All software typically runs with some sort of topology. Puppet and Chef normally run in a client server topology, where you typically have one server with many clients, each running an agent. They also both offer a standalone mode, but in general this is not more interesting than running a fancy bash script. In this context, I define interesting as “relating to clustered, multiple machine architectures”. Here in graph g5 you can see one server which has three clients initiating requests to it. This traditional model of computing is well-known, and fairly easy to reason about. You typically put all of your code in one place (on the server) and the clients or agents need very little personalized configuration to get working. However, it can suffer from performance and scalability issues, and it can also be a single point of failure for your infrastructure. Make no mistake: if you manage your infrastructure properly, then when your configuration management infrastructure is down, you will be unable to bring up new machines or modify existing ones! This can be a disastrous type of failure, and is one which is seldom planned for in disaster recovery scenarios! Other systems such as Ansible are actually orchestrators, and are not technically configuration management in my opinion. That doesn’t mean they don’t share much of the same problem space, and in fact they are usually idempotent and share many of the same properties of traditional configuration management systems. They are useful and important tools! The key difference about an orchestrator, is that it typically operates with a push model, where the server (or the sysadmin laptop) initiates a connection to the machines that it wants to manage. One advantage is that this is sometimes very easy to reason about for multi machine architectures, however it shares the usual downsides around having a single point of failure. Additionally there are some very real performance considerations when running large clusters of machines. In practice these clusters are typically segmented or divided in some logical manner so as to lessen the impact of this, which unfortunately detracts from the aforementioned simplicity of the solution. Unfortunately with either of these two topologies, we can’t immediately detect when an issue has occurred and respond immediately without sufficiently advanced third party monitoring. By itself, a machine that is being managed by orchestration, cannot detect an issue and communicate back to its operator, or tell the cluster of servers it peers with to react accordingly. The good news about current and future generation topologies is that algorithms such as the Paxos family and Raft are now gaining wider acceptance and good implementations now exist as Free Software. Mgmt depends on these algorithms to create a mesh of agents. There are no clients and servers, only peers! Each peer can choose to both export and collect data from a distributed data store which lives as part of the cluster of peers. The software that currently implements this data store is a marvellous piece of engineering called etcd. 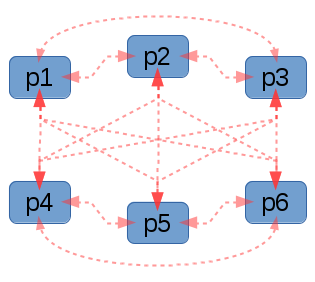 In graph g7, you can see what a fully interconnected graph topology might look like. It should be clear that the numbed of connections (or edges) is quite large. Try and work out the number of edges required for a fully connected graph with 128 nodes. Hint, it’s large! In practice the number of connections required for each peer to connect to each other peer would be too great, so instead the cluster first achieves distributed consensus, and then the elected leader picks a certain number of machines to run etcd masters. All other agents then connect through one of these masters. The distributed data store can easily handle failures, and agents can reconnect seamlessly to a different temporary master should they need to. If there is a lack or an abundance of transient masters, then the cluster promotes or demotes an agent automatically by asking it to start or stop an etcd process on its host. In graph g8, you can see a tightly interconnected centre of nodes running both their configuration management tasks, but also etcd masters. Each additional peer picks any of them to connect to. 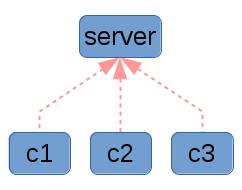 As the number of nodes scale, it is far easier to scale such a cluster. Future algorithm designs and optimizations should help this system scale to unprecedented host counts. It should go without saying that it would be wise to ensure that the nodes running etcd masters are in different failure domains. By allowing hosts to export and collect data from the distributed store, we actually end up with a mechanism that is quite similar to what Puppet calls exported resources. In my opinion, the mechanism and data interchange is actually a brilliant idea, but with some obvious shortcomings in its implementation. 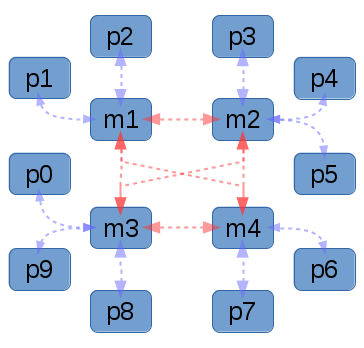 This is because for a cluster of N nodes, each wishing to exchange data with one another, puppet must run N times (once on each node) and then N-1 times for the entire cluster to see all of the exchanged data. Each of these runs requires an entire sequential run through every resource, and an expensive check of each resource, each time. In contrast, with mgmt, the graph is redrawn only when an etcd event notifies us of a change in the data store, and when the new graph is applied, only members who are affected either by a change in definition or dependency need to be re-run. In practice this means that a small cluster where the resources themselves have a negligible apply time, can converge a complete connected exchange of data in less than one second. An example demonstrates this best. 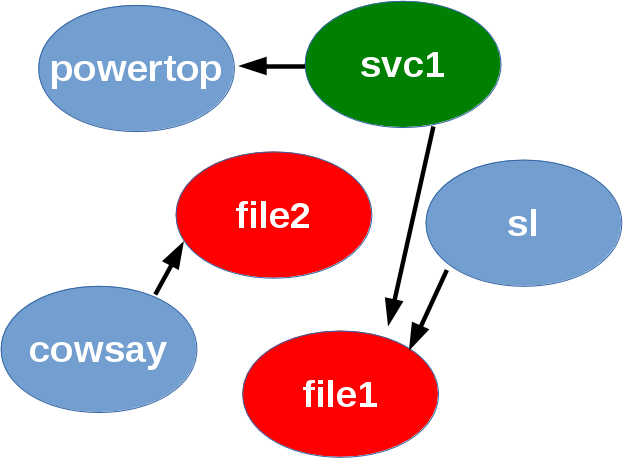 I have three nodes in the system: A, B, C.
Each creates four files, two of which it will export. On host A, the two files are: /tmp/mgmtA/f1a and /tmp/mgmtA/f2a. On host A, it exports: /tmp/mgmtA/f3a and /tmp/mgmtA/f4a. It is done similarly with B and C, except with the letters B and C substituted in to the emphasized locations above. For demonstration purposes, I startup the mgmt engine first on A, then B, and finally C, all the while running various terminal commands to keep you up-to-date. 01:52:38 main.go:192: Converged for 5 seconds, exiting! Amazingly, the cluster converges in less than one second. Admittedly it didn’t have large amounts of IO to do, but since those are fixed constants, it still shows how fast this approach should be. Feel free to do your own tests to verify. The code is publicly available and has been for some time. I wanted to release it early, but I didn’t want to blog about it until I felt I had the initial design triad completed. It is written entirely in golang, which I felt was a good match for the design requirements that I had. It is my first major public golang project, so I’m certain there are many things I could be doing better. As a result, I welcome your criticism and patches, just please try and keep them constructive and respectful! The project is entirely Free Software, and I plan to keep it that way. As long as Red Hat is involved, I’m pretty sure you won’t have to deal with any open core compromises! There’s an IRC channel going. It’s #mgmtconfig on Freenode. Please come hangout! If we get bigger, we’ll add a mailing list. There are a few caveats that I’d like to mention. Please try to keep these in mind. This is still an early prototype, and as a result isn’t ready for production use, or as a replacement for existing config management software. If you like the design, please contribute so that together we can turn this into a mature system faster. There are some portions of the code which are notably absent. In particular, there is no lexer or parser, nor is there a design for what the graph building language (DSL) would look like. This is because I am not a specialist in these areas, and as a result, while I have some ideas for the design, I don’t have any useful code yet. For testing the engine, there is a (quickly designed) YAML graph definition parser available in the code today. The etcd master election/promotion portion of the code is not yet available. Please stay tuned! There is no design document, roadmap or useful documentation currently available. I’ll be working to remedy this, but I first wanted to announce the project, gauge interest and get some intial feedback. Hopefully others can contribute to the docs, and I’ll try to write about my future design ideas as soon as possible. The name mgmt was the best that I could come up with. If you can propose a better alternative, I’m open to the possibility. I work for Red Hat, and at first it might seem confusing to announce this work alongside our existing well-known Puppet and Ansible teams. To clarify, this is a prototype of some work and designs that I started before I was employed at Red Hat. I’m grateful that they’ve been letting me work on interesting projects, and I’m very pleased that my managers have had the vision to invest in future technologies and projects that (I hope) might one day become the de facto standard. It is with great honour, that my first public talk about this project will be at Config Management Camp 2016. I am thrilled to be speaking at such an excellent conference, where I am sure the subject matter will be a great fit for all the respected domain experts who will be present. Find me on the schedule, and please come to my session. I’m also fortunate enough to be speaking about the same topic, just four days later in Brno, at DevConf.CZ. It’s a free conference, in an excellent city, and you’ll be sure to find many excellent technical sessions and hackers! I hope to see you at one of these events or at a future conference. If you’d like to have me speak at your conference or event, please contact me! Thank you for reading this far! I hope you appreciate my work, and I promise to tell you more about some of the novel designs and properties that I have planned for the future of mgmt. Please leave me your comments, even if they’re just +1’s. There seems to be a new trend about calling certain types of management systems or designs “choreography”. Since this term is sufficiently overloaded and without a clear definition, I choose to avoid it, however it’s worth mentioning that some of the ideas from some of the definitions of this word as pertaining to the configuration management field match what I’m trying to do with this design. Instead of using the term “choreography”, I prefer to refer to what I’m doing as “configuration management”. Some early peer reviews suggested this might be a “puppet-killer”. In fact, I actually see it as an opportunity to engage with the puppet community and to share my design and engine, which I hope some will see as a more novel solution. Existing puppet code could be fed through a cross compiler to output a graph that actually runs on my engine. While I plan to offer an easier to use and more powerful DSL language, the 80% of existing puppet code isn’t more than plumbing, package installation, and simple templating, so a gradual migration would be possible, where the multi-system configuration management parts are implemented using my new patterns instead of with slowly converging puppet. The same things could probably also be done with other languages like Chef. Anyone from Puppet Labs, Chef Software Inc., or the greater hacker community is welcome to contact me personally if they’d like to work on this. Lastly, but most importantly, thanks to everyone who has discussed these ideas with me, reviewed this article, and contributed in so many ways. You’re awesome!